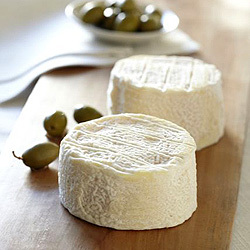 Cremont is a mixed-milk cheese combining cows and goats’ milk with a hint of Vermont cream. Blended together, pasteurized, then a special cocktail of yeast and mold are added to create its unique flavor and naturally coagulate the milk overnight. The next day, the fresh curd is shaped by hand into cylinders. Fresh cheeses will first be moved into a drying room to slightly dry the surface, then into the aging room where the geotrichum yeast will slowly grow on the surface to create its unique wrinkled cream colored rind. “After making good crème fraiche and butter for a quarter century, we know that everyone loves cream. Why not blend it into a traditional French-style goat cheese for something irresistible?” says Vermont Creamery co-founder, Allison Hooper. It has the texture and citrus tang of a soft goat cheese with the rich decadence of crème fraiche. “We wanted to make a cheese that was approachable for cheese consumers who didn’t know they could love a goat cheese and a cheese with a wrinkled and edible rind,” says Hooper. This is a great example to introduce to customers who are looking for American artisan cheese. As a fresh cheese, Cremont is mild and creamy. As it ages, the rind is aromatic while the interior of the cheese gets softer. It is delicious at all stages of maturity; complex yet never too strong.